The village of Snow Mountain is a peaceful place; nearly all of its citizens are sheep, and the town devotes itself to making music and making yarn. The town’s peace is based on its two Tibetan Mastiffs – Khampa, who protects the village from a nearby gang of wolves, and Khampa’s son Bodi, who is expected to follow in his father’s footsteps as the next protector of Snow Mountain. Khampa’s strength comes from a fire that he has found within himself; his hatred of wolves helps him defend the village from them. Bodi does not have that fire. Bodi’s fascination with music has left him disinterested in defending the village, and in response Khampa has banned music from the village. When a radio falls from the sky, Bodi becomes interested in Rock and Roll. His father reluctantly sends Bodi to the big city to follow his dreams, on the condition that if Bodi’s efforts to become a rock star fail, he will return to the village. The wolves notice that Bodi leaves the village; they believe that if they can capture him, the village will be theirs. Meanwhile, Khampa trains an army of disguised sheep in hopes of keeping the wolves away. There are no adoption themes. 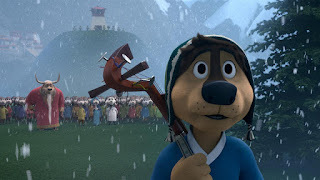 Rock Dog does feature the “teen breaking away from their parents to become their own person” theme that seems so common in films for young audiences; Bodi is expected to follow in his parent’s footsteps but doesn’t want to. His father resists but then gives in, Bodi finds his own passion, and then reconciles his passion with his father’s expectations. Khampa lets Bodi pursue his own dreams, and in fulfilling his dreams, Bodi finds a way to fulfill Khampa’s mission. Now that I think of it, in this respect, it’s kind of similar to Moana. Some enemies appear to have reconciled with the heroes by the end of the film. Khampa tries to scare Bodi into responsible behavior, but it goes disastrously wrong. In a surprisingly twisted scene, the wolves invade Snow Mountain; they tie up Khampa, and prepare to feed him some of the sheep he has lived to protect. Rock Dog feels a bit familiar; the theme of a kid distinguishing themselves from their parents is pretty prevalent in kids’ films. The newer twist of the kid using their own dreams and skills to accomplish the very goals about which their parents were anxious is positive, but it’s also seen some recent airtime in Moana and, to some extent, in the recent Jungle Book remake. It’s a bit scary when the wolves invade Snow Mountain – they prepare to barbecue some still-living sheep, and intend to feed some of them to Khampa in a cruel act. 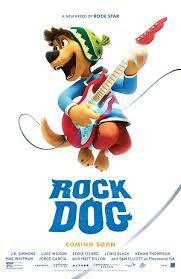 Outside of this, Rock Dog is a pretty light hearted movie that should be fun for most kids ages 8-10 or so. Kids 4 and up might like it, too, if the scary scenes aren’t too scary for them. How can parents and their kids find a balance between the kids’ dreams and the parents’ expectations? What expectations did Khampa have of Bodi? Do you think they were fair? Love Adoption at the Movies? Check out our book, or support us on Patreon!